Introduction: Angular deformities of the pediatric knees result in pain, gait disturbance, early joint degeneration, and cosmetic problems. Most of them are physiological and resolve spontaneously before the age of eight years. Persistent angular deformities must be corrected. 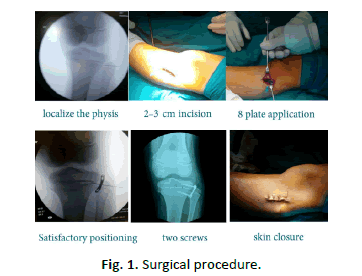 Different methods are used to correct these deformities; Osteotomy, stapling, percutaneous drill technique and transphyseal screw. These all were reported with several complications. 8-Plate temporary hemiepiphysiodesis is a new idea yielding good results with less complications. The purpose of this study is to evaluate the rate of correction of angular deformities by eight-Plate hemiepiphysiodesis. Methods: twenty-three patients (50 physes, 35 limbs) underwent treatment between January 2016 and June 2017 with average follow-up after plate implantation of 8.2 months (range, 3 - 18 months). Rate of correction of this intervention was calculated. Results: Average age at eight-Plate implantation was 5.7 + 3.1 years (age range, 3 years to 12 years). Mechanical tibiofemoral angle changed by an average 12.3° + 7°, (range 3° to 26.67°) or 1.7° + 1.1°/month, (range 0.14° to 4.5°/month). Mechanical lateral distal femoral angle changed by an average 8.6° + 2.8° (range, 4° to 14°) or 1.3° + 0.6°/month (range, 0.6° to 2°/month). Medial proximal tibial angle changed by an average 8.6° + 6.1° (range, 3° to 20°) or 1° + 0.7°/month (range, 0.4° to 2.6°/month). Conclusion: 8-Plate hemiepiphysiodesis is an effective method for correcting angular deformities of the knee in skeletally immature patients. Knee angular deformities can be idiopathic or due to pathological etiologies such as rickets or skeletal dysplasia. Physiological deformities peak between 1 and 3 years (varus) or between 3 and 6 years (valgus) and resolve spontaneously . Malalignment of the knee leads to a pathological mechanical load that may cause early joint degeneration. Valgus deformities more than 10 degrees may cause knee pain, circumduction gait, and patellofemoral instability . Varus deformities may result in ligamentous laxity, lateral thrust, and a waddling gait. Several methods are used to achieve normal alignment. Although osteotomy has been considered the gold standard for correcting angular deformities, it is fraught with potential complications [3,4]. The accompanying immobilization, discomfort, hospitalization, recovery time, and risks make osteotomy, the last option for angular corrections while the physis is still open. Stapling  has diminished in popularity since its introduction by Blount, Stapling has problems related to implant failure as migration and breakage, and the fear of permanent physeal arrest [6-9]. Me´taizeau , suggested the use of transphyseal screws but it results in physeal violation. To avoid these complications, a different hardware construct was embraced, using a nonlocking extra periosteal plate and two screws (eight-Plate); this construct guides the physis growth with less complications and high efficacy [11-14]. There is no contraindication for guided growth except physeal closure due to damage or skeletal maturity. The purpose of this study is to evaluate the rate of correction of angular deformities by eight-Plate hemiepiphysiodesis. Any child has angular deformity with open physis was included in this study except those with physiological deformities (Varus deformity in children younger than 3 years or valgus deformity in children younger than 6 years). Children with closed physis (either due to damage or skeletal maturity) were excluded from this study. Informed consent was obtained from the primary caregiver of children and the procedure was approved by Ethical Committee of our Faculty of Medicine. Twenty-three children, 12 boys and 11 girls (mean age of 5.7 years, range 3 years to 12 years) were included in this prospective trial. Genu valgum deformity was noted in 14 patients (60.8%) whereas genu varum deformity noted in 9 patients (39.2%). Bilateral deformities noted in 12 patients (52%) whereas unilateral deformities noted in 11 patients (48%). 35 limbs (cases) and 50 physes (segments) implanted with eight-Plate. Gait, foot progression angle symmetry, stature and limb length were examined in every patient. Preoperative x-rays of the knee (antero-posterior and lateral) were taken in all patients. Standing long film including hip, knee and ankle measuring the mechanical tibio-femoral, mechanical lateral distal femoral, and mechanical medial proximal tibial angles done for all patients. Preoperative interfemoral or intermalleolar distances were also measured. All the measurements were made twice: Once before surgery and at the time of final follow-up. The surgery is performed under general anesthesia. Tourniquet is applied. The level of the physis on the relevant side and segment (distal femur or proximal tibia) is identified using fluoroscopy. Localization of the physis by a needle under fluoroscopic guidance was done. The centre of the physis is estimated by palpating the anterior and posterior margins of the femur or tibia and placing a 2 cm skin incision over this position. The surface of the target bone is exposed extraperiosteally by blunt dissection, taking care not to injure the periosteum or the perichondrial ring. The plate is placed over the physis and provisionally secured with a hypodermic needle or a thin k-wire (0.8cm) through the small central hole in the plate. Satisfactory positioning was confirmed by fluoroscopy. The cortex was broached using a drill and a self-tapping titanium screw was inserted into each of the main holes of the 8-plate, in a direction parallel to the physeal plate, and checked by fluoroscopy both in the anteroposterior and lateral views. The wound was sutured in layers and a compression bandage was applied (Fig. 1). No immobilization required after surgery, and early weight-bearing is encouraged along with a rapid return to normal activities, partial weight bearing is allowed from the second day. Full range of motion of the knee is encouraged and quadriceps muscle strengthening exercises also are advised. Evaluations were performed to assess the deformity correction approximately every 3 months until reaching the neutralization of the mechanical axis. When clinical correction of the deformity was deemed satisfactory, a standing long film was obtained to confirm the clinical impression. The desired correction was restoration of the mechanical axis to within the inner two zones of a six-zone division of an anteroposterior radiograph of the knee. Plate removal was undertaken as one day surgery. Following plate removal, periodic follow-up (until bone maturity) is recommended for all patients to assess if rebound growth, limb length discrepancy, or premature physeal closure had occurred. All data were collected and statistically analyzed by SPSS v. 20 by paired t-test. The pre-operative deformity ranged from 49° varus to 34° valgus. The mean deformity for genu varum was 21.8° (range 10° to 49°) and 22° (range 13.9° to 34°) for genu valgum. The mean varus angled improved from 21.8° to 13.6° whereas the valgus improved from 22° to 11.6° (chart 1). Post-operatively the patients showed improvement in all parameters measured and these were found to be statistically significant (Table 1). Table 1. Average improvement of MTFa by hemiepiphysiodesis. 35 limbs (cases), 50 physes were implanted with eight-Plates. In this study, Rickets caused most of the cases with angular deformities. 11 patients (47.8%) resulted from rickets of different types. 4 patients (17.4%) caused by skeletal dysplasia, 3 patients (13%) presented after osteoclasis, 3 patients (13%) were post traumatic deformity after fracture of proximal tibia and 2 patients (8.7%) were idiopathic in etiology. 18 patients (78.3%) were younger than 10 years old and 5 patients (21.7%) were older than 10 years. Determining the diseased bone segment can be based on measuring the lateral distal femoral angle and the medial proximal tibial angle . Of the 50 physes which were implanted by eight-Plates; 18 eight plates were implanted in the medial proximal tibial physis MPT (36%), And 9 eight plates for lateral proximal tibial physis LPT (18%). Distal femur physes implanted by 23 eight plates (10 for lateral distal femoral physis LDF (20%) and 13 for medial distal femoral physis MDF (26%) (Fig. 2 and 3). Fig 2: A male child 4-years-old, bilateral genu valgum deformity after he had osteoclasis, (A and B): Pre-operative, (C and D): 9.5 months later after hemiepiphysiodesis. Fig 3: A male child 11-years-old, with idiopathic Lt genu varm deformity, (A and B): Pre-operative (C and D): 15 months later. Rate of correction of angular deformity more rapid when distal femur physis was manipulated (1.9°/month) compared to (1.1°/month) when proximal tibial physis was manipulated and more rapid correction when both distal femur and proximal tibial physes were manipulated (2.1°/month). The mechanical tibiofemoral angle (MTFa) improved by an average of 12.3° + 7.1°, (range 3° to 26.67°) or 1.7° + 1.1°/month, (range 0.14° to 4.5°). This is statistically significant improvement (P=0.0001) (Fig. 4). Fig 4: Mean correction of angular deformities in degrees. The mechanical tibiofemoral angle improved in cases younger than 10 years by an average of 13.7° + 7°, (range 4° to 26.67°) or 2.1° + 1°/month (range 0.4° to 4.5°/month). And improved in cases older than 10 years by an average of 6.4° + 3.7°, (range 3° to 12.84°) or 0.6° + 0.29°/month, (range 0.3° to 0.86°/month). There is statistically significant difference between both groups (P=0.022). The mechanical tibiofemoral angle (MTFa) improved in cases caused by skeletal dysplasia by an average of 2.4° + 3.5°, (range 0° to 8°) or 0.28° + 0.44°/month, (range 0° to 1°/month), compared to average of 12.6° + 7°, (range 3° to 26.67°) or 1.8° + 1.1°/month, (range 0.14° to 4.5°/month) in cases caused by other etiologies. There is significant difference between the two groups (P=0.008). Improvement of mechanical Lateral distal femoral angle (mLDFA): The mechanical lateral distal femoral angle by an average of 8.6° + 2.8°, (range 4° to 14°) or 1.3° + 0.6°/month, (range 0.6° to 2°/ month). The mechanical Medial proximal tibial angle improved by an average of 8.6° + 6.1° (range 3° to 20°) or 1° + 0.7°/month (range 0.4° to 2.6°/month). The intercondylar distance and intermalleolar distance improved from 9.4 cm to 4 cm and 12.8 cm to 5.6 cm respectively. Three patients were excluded from the joint angles measurements; the first patient was a female child aged 3 years old, with left genu varum deformity, treated with eight-Plate, she got deep infection and removal of implants was done. The second patient was a female child aged 12 years old, with post traumatic right genu varum deformity, eight plates implanted in lateral proximal tibial physis, she is excluded as she underwent simultaneous corrective osteotomy and internal fixation. The third patient was excluded because he didn’t come for the follow up visits after surgery. The treatment failed in two children, the treatment failed because of the limited growth secondary to underlying bone illness; one diagnosed as metaphyseal chondrodysplasia and the second with osteogenesis imperfecta. The application of an extra-periosteal tension band to a growing physis has proven to be adaptable solution for a variety of deformities [11,12]. We have adopted a different approach for treatment according to the etiology; patients with pathological deformities that are likely to progress were treated earlier (3 years-13 years) than those with idiopathic deformities (8 years to 14 years). Early intervention for deformities of pathological etiology is highly recommended, even if the process has to be repeated during continued growth. There may be secondary benefits noted at the hip and ankle, and osteotomies may be postponed or perhaps even prevented. In this study, 18 of 23 patients (78.3%) were younger than 10 years old. This was done on the premise that a flexible tension band that does not compress the physis is unlikely to have an adverse effect on physeal closure [12,16]. Eight-Plate can be used in younger patients with high degrees of angular deformities for a longer duration because the screws in the 8-plate are free to diverge approximately 30°; that covers 95% of the deformities we are apt to encounter. After maximal divergence, the convex, pre-contoured plate may be observed to straighten or even reverse its bend. On rare occasions a given screw may be retrieved and exchanged percutaneously. Unlike to staples, it is recommended that the Blount staples be removed after a maximum time of 24 months due to the risk of premature closure of the physis . Staple epiphyseodesis is not recommended for children younger than ten years. Raab et al. observed a higher rate of loosening and displacement of the staples in children younger than eight years, which was statistically significant. In this study, rapid rate of correction observed in patients aged less than ten years treated with eight-plate. The mean rate of mechanical axis correction in patients younger than 10 years old per month was 2.1 degrees, compared to 0.6 degrees in patients older than 10 years old, and this is statistically significant (P-value=0.022). This is noted also by Burghardt et al. and Ballal . Rapid rate of mechanical axis change was noted with healthy physis rather than sick one, especially if the child younger than 10 years old. The mean rate of mechanical axis changes per month in dysplasia/syndrome group averaged by 0.28 degrees, compared with 1.8 degrees in cases caused by other causes rather than dysplasia, and this is statistically significant (P-value=0.008). And this also noted by Silvio Boero et al. . In this study, we did not face with Complications reported with other techniques such as hardware failure, physeal violation by the implant, premature physeal closure, and overcorrection. Unlike, hemiepiphysiodesis employing multiple staples, their insertion or removal poses a risk of producing a physeal bar which demonstrated by Aykut et al. .
Stevens  noted a 45% incidence of staple migration in children with rickets and 41% rebound growth with 1-year follow-up. It is our belief that a more rapid rate of correction accompanies the use of a flexible implant and that this is probably more physiologic for the physis. In this study, the mean rate of change mechanical axis for patients per month with eight- Plate averaged 1.7 degrees. The mean change in the mechanical axis after instrumentation of the proximal tibial physis was found to be 1.1 degree per month, compared to rate of change after instrumentation of distal femoral physis which 1.9 degrees was, and after instrumentation of both physes was 2.1 degrees. And this constant with Burghardt et al. study. Our results compared with results published by Pablo Castan et al. , showed superiority of the eight-plate over staples in regard of speed of angular correction and this is constant with Kumar A et al. study . Also, Stevens  stated that the rate of correction accompanies eight- Plate 30% faster than that with staples. Easier and shorter time of surgical procedure was noted with eight-Plates compared with stapling. Only one plate with two cannulated screws required for the physis though a small incision and subcutaneously applied, with low risk of periosteal injury. Eva Maria Jelinek and his colleagues  reported the surgical time was significantly shorter by an average of ten minutes for implantation and 12 minutes for explantation with eight-plate than staples. We need more time for follow up the patients to gather more data, it is recommended to follow up patients until skeletal maturity to assess if rebound growth, limb length discrepancy, or premature physeal closure had occurred. In cases with bilateral deformity, we noted different rate of correction of the two sides of the same patient with the same etiology although the same implant used in both sides by the same surgeon, may be a question of interest in next literatures. 8-plate hemiepiphysiodesis is an effective method for correcting angular deformities of the knee in skeletally immature patients. Brooks W.C., Gross R.H.: Genu varum in children: diagnosis and treatment. J Am Acad Orthop Surg. 1995;3:326-335. Fabry G., MacEwen G.D., Shands A.R. : Torsion of the femur. A follow-up study in normal and abnormal conditions. J Bone Joint Surg Am. 1973;55:1726-1738. Mycoskie P.: Complication of osteotomies about the knee in children. Orthopedics. 1981;4:1005-1015. Steel H.H., Sandrow R.E., Sullivan P.D., et al: Complications of tibial osteotomy in children for genu varum or valgum. Evidence that neurological changes are due to ischemia. J Bone Joint Surg Am. 1971;53:1629-1635. Blount W.P., Clarke G.R. : Control of bone growth by epiphyseal stapling; a preliminary report. J Bone Joint Surg Am. 1949;31A:464-478. Bylski-Austrow D.I., Wall E.J., Rupert M.P., et al: Growth plate forces in the adolescent human knee: A radiographic and mechanical study of epiphyseal staples. J Pediatr Orthop. 2001;21:817-823. Frantz C.H. : Epiphyseal stapling: A comprehensive review. Clin Orthop Relat Res. 1971;77:149-157. Zuege R.C., Kempken T.G., Blount W.P. : Epiphyseal stapling for angular deformity at the knee. J Bone Joint Surg Am. 1979;61:320-329. Kumar A., Gaba S., Sud A., et al. : Comparative study between staples and eight plate in the management of coronal plane deformities of the knee in skeletally immature children. J Child Orthop. 2016;10:429-437. Me´taizeau J.P., Wong-Chung J., Bertrand H., et al: Percutaneous epiphysiodesis using transphyseal screws (PETS).J Pediatr Orthop. 1998;18:363-369. Stevens P.M., Pease F.: Hemiepiphysiodesis for posttraumatic tibial valgus. J Pediatr Orthop. 2006;26:385-392. Novais E., Stevens P.M.: Hypophosphatemic rickets: The role of hemiepiphysiodesis. J Pediatr Orthop. 2006;26:238-244. Gottliebsen M., Shiguetomi-Medina J.M., Rahbek O., et al. : Guided growth: Mechanism and reversibility of modulation. J Child Orthop. 2016;10:471-477. Kumar S.: Sonanis S.V. : Growth modulation for coronal deformity correction by using eight plates—A systematic review. Journal of Orthopaedics. 2018;15:168-172. Paley D.: Principles of deformity correction. Berlin New York: Springer; 2002.pp. xxv, 806. Kulkarni R.M., Rushnaiwala F.M.I., Kulkarni G.S., et al. : Correction of coronal plane deformities around the knee using a tension band plate in children younger than 10 years. Indian J Orthop. 2015;49:208-218. Stevens P.M.: Guided growth for angular correction: A preliminary series using a tension band plate. J Pediatr Orthop. 2007;27:253-259. Raab P., Wild A., Seller K., et al: Correction of length discrepancies and angular deformities of the leg by Blount’s epiphyseal stapling. Eur J Pediatr. 2001;160:668-674. Burghardt R.D., Herzenberg J.E., Standard S.C., et al. : Temporary hemiepiphyseal arrest using a screw and plate device to treat knee and ankle deformities in children: a preliminary report. J Child Orthop. 2008;2:187-197. Ballal M.S., Bruce C.E., Nayagam S.: et al. : Correcting genu varum and genu valgum in children by guided growth. J Bone Joint Surg [Br]. 2010;92-B:273-276. Silvio B., Maria B.M., Simone R.: Use of the eight-plate for angular correction of knee deformities due to idiopathic and pathologic physis: initiating treatment according to etiology. J Child Orthop. 2011;5:209-216. Aykut U., Yazici M., Kandemir U., et al. : The effect of temporary hemiepiphyseal stapling on the growth plate. J Pediatr Orthop. 2001;25:336-341. Peter M.S., Joshua B.K. : Guided growth for pathological physes: Radiographic improvement during realignment. J Pediatr Orthop. 2008; 28:632-639. Castan˜eda P.: Hemiepiphysiodesis for the correction of angular deformity about the knee. J Pediatr Orthop. 2008;28:188-191. Stevens P.: Guided growth: 1933 to the present. Strategies Trauma Limb Reconstr. 2006;1:29-35. Jelinek. : The 8-plate versus physeal stapling for temporary hemiepiphyseodesis correcting genu valgum and genu varum: a retrospective analysis of thirty five patients. J Child Orthop. 2011;5:209-216.